Ji-Man, Willy Adames and former Rays outfielder Carlos Gómez would often get together before games to plan their dance celebrations last season…the trio would watch dance videos featuring Michael Jackson or Dominican artist Sujeto oro 24 for inspiration...He visited Disney World in Orlando as soon as the 2018 season ended, documenting much of it on his Instagram account...Despite not spending the full 2018 campaign with the Rays, Ji-Man wasted no time in winning over his teammates…Manager Kevin Cash: "He's a piece of work. Great one-liners. He takes a lot of jokes in stride. And he dishes it really well. He's definitely done a good job of keeping the dugout loose." …Kevin Kiermaier: "He's hilarious. He knows how to talk trash, all the bad words. And he talks Spanish, too, just as much Spanish as English"...Ji-Man is one of six active major leaguers born in South Korea. Acquired from the Brewers in mid-June and played in 49 games with 45 starts (44-DH, 1-1B) for the Rays…after joining the Rays, hit .269/ .370/.506 (43-for-160) with 8 HR and 27 RBI...Hit .292/.400/.584 (33-for-113) with 7 HR and 20 RBI in his last 35 games (31 starts), increasing his season avg. from .221 to .263...Following the trade, hit .337 (31-for-92) with 11 2B and 5 HR with the bases empty and .176 (12-for-68) with 1 2B and 3 HR with runners on...On July 21 vs. MIA, his first home run as a Ray came in the 9th inning off Kyle Barraclough and went 460 feet, according to StatCast…at the time, it was the longest by a Ray since Evan Longoria on July 19, 2016 at COL (462 feet) and the longest by a Ray at Tropicana Field since StatCast started tracking them in 2015…including visitors, it was the 4th-longest at Tropicana Field over that span and the longest since SEA Nelson Cruz on Aug 18, 2017 (482 feet, off Brad Boxberger)...Reached base safely in 22 consecutive starts, Aug 9-Sep 12, batting .333/.427/.679 (27-for-81) with 6 HR and 16 RBI over that stretch...On Sep 7 vs. BAL, tied a career high with 4 RBI, all coming on the second grand slam of his career, in the 6th inning off Ryan Meisinger… was his fifth homer with the Rays and first with runners on base...On Sep 10 vs. CLE, hit a walk-off, 2-run homer off Brad Hand, giving the Rays a 6-5 win…it was his first career walk-off hit, and it was the 15th homer of his career and first off a left-handed pitcher…his walk-off homer was the third in franchise history hit by a left-handed hitter off a left-handed pitcher, joining Jake Bauers on June 24, 2018 vs. NYY (Chasen Shreve) and Gabe Gross on June 1, 2008 vs. CWS (Matt Thornton)...On Sep 25 vs. NYY, received stitches for a left ear laceration suffered on a 3rd-inning collision at home plate…missed the final 5 games...Was optioned to Triple-A Durham after the trade…recalled on July 10 and made his Rays debut the next day vs. DET, going 2-for-4...Hit a pinch-hit grand slam on June 9 at PHI, his final at-bat with the Brewers…was the sixth pinch-hit grand slam hit by a Brewer since Baseball Reference play-by-play data is complete (1974)…turned a 3-2 deficit to a 6-3 lead. Limited to 23 games last season but posted a .290 (20/69) average with five doubles, a home run and 18 RBI with Triple-A Tacoma (Seattle) and the AZL Mariners. Suffered a broken leg March 4 in the 9th inning of Seattle's Cactus League opener vs. San Diego... Played in first minor league game of the season Aug. 12 with the AZL Mariners... Went 3-for-12 in five games with the Club before being moved to Triple-A... In 18 games with the Rainiers, hit .298 (17/57) with four doubles, a home run and 16 RBIs. Participated in the Dominican Winter League, batting .231 (12/52) with a double, triple, three home runs and nine RBI in 15 games for the Estrellas de Oriente. Signed a minor league contract with Baltimore in the off season before being selected by the Angels in the Rule 5 Draft , Dec. 10. Appeared in 74 games with AAA Tacoma (70 G) and AA Jackson (4 G)during the season…hit .282 (70x248) with 8 doubles, 2 triples, 6 home runs and 35 RBI... Opened the season batting .394 (13x38) with a 1.045 OPS in ﬁrst 9 gamesbefore serving 50-game suspension... Hit .318 (21x66) with 13 runs, 4 home runs and 10 RBI over his ﬁnal 28games (July 30-Sept. 1)... On MLB suspended list April 17-June 9 (50 games) after testing posi-tive for a performance enhancing substance... Appeared in 14 games for Tigres de Aragua in the Venzuelan WinterLeague (.220/11x50, 10 R, 2 2B, HR, 7 RBI)…experimented with switch hitting. Hit .295 (125x424) with 64 runs scored, 36 doubles, 6 triples, 18 home runs, 85 RBI and 63 walks in 122 games combined between A High Desert (4/4/-6/2), AA Jackson (6/3- 8/18) and AAA Tacoma (8/19-9/2). One of 20 minor league players to record at least 60 extra-base hits. Career-high 21-game hitting streak from April 27-May 22, 3rd-longest in the California League (.422/35x83, 20 R, 15 2B, 3B, 5 HR, 26 RBI, 13 BB). Promoted to Jackson on June 4…appeared in only 61 games with the Generals, finished T2nd on the team with 9 home runs, including a team-high 2 grand slams (6/29 vs. Birmingham and 7/31 vs. Huntsville). Also appeared in 13 games with Tacoma to close out the season. April 24, 2019 Tampa Bay Rays activated 1B Ji-Man Choi from the restricted list. 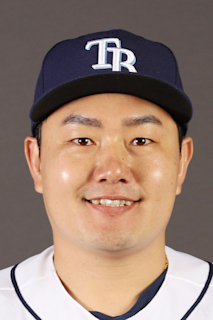 April 23, 2019 Tampa Bay Rays placed 1B Ji-Man Choi on the restricted list. July 10, 2018 Tampa Bay Rays recalled 1B Ji-Man Choi from Durham Bulls. June 11, 2018 Tampa Bay Rays optioned 1B Ji-Man Choi to Durham Bulls. June 10, 2018 Tampa Bay Rays traded cash and 1B Brad Miller to Milwaukee Brewers for 1B Ji-Man Choi. June 10, 2018 Milwaukee Brewers optioned 1B Ji-Man Choi to Colorado Springs Sky Sox. June 1, 2018 Milwaukee Brewers recalled Ji-Man Choi from Colorado Springs Sky Sox. May 24, 2018 Milwaukee Brewers optioned 1B Ji-Man Choi to Colorado Springs Sky Sox. May 18, 2018 Milwaukee Brewers recalled Ji-Man Choi from Colorado Springs Sky Sox. March 30, 2018 Milwaukee Brewers optioned 1B Ji-Man Choi to Colorado Springs Sky Sox. March 28, 2018 Milwaukee Brewers selected the contract of Ji-Man Choi from Colorado Springs Sky Sox. January 19, 2018 1B Ji-Man Choi assigned to Colorado Springs Sky Sox. January 15, 2018 Milwaukee Brewers signed free agent 1B Ji-Man Choi to a minor league contract and invited him to spring training. October 13, 2017 1B Ji-Man Choi elected free agency. September 18, 2017 Scranton/Wilkes-Barre RailRiders activated 1B Ji-Man Choi from the 7-day disabled list. September 10, 2017 Scranton/Wilkes-Barre RailRiders placed 1B Ji-Man Choi on the 7-day disabled list retroactive to September 8, 2017. July 23, 2017 New York Yankees sent 1B Ji-Man Choi outright to Scranton/Wilkes-Barre RailRiders. July 19, 2017 New York Yankees designated 1B Ji-Man Choi for assignment. July 5, 2017 New York Yankees selected the contract of 1B Ji-Man Choi from Scranton/Wilkes-Barre RailRiders. May 24, 2017 Scranton/Wilkes-Barre RailRiders activated 1B Ji-Man Choi from the 7-day disabled list. May 14, 2017 Scranton/Wilkes-Barre RailRiders placed 1B Ji-Man Choi on the 7-day disabled list. January 20, 2017 1B Ji-Man Choi assigned to Scranton/Wilkes-Barre RailRiders. January 14, 2017 New York Yankees signed free agent 1B Ji-Man Choi to a minor league contract and invited him to spring training. January 11, 2017 1B Ji-Man Choi elected free agency. January 5, 2017 Los Angeles Angels sent 1B Ji-Man Choi outright to Salt Lake Bees. December 23, 2016 Los Angeles Angels designated 1B Ji-Man Choi for assignment. September 3, 2016 Los Angeles Angels recalled 1B Ji-Man Choi from Salt Lake Bees. August 21, 2016 Los Angeles Angels optioned 1B Ji-Man Choi to Salt Lake Bees. July 9, 2016 Los Angeles Angels selected the contract of Ji-Man Choi from Salt Lake Bees. May 15, 2016 Los Angeles Angels sent LF Ji-Man Choi outright to Salt Lake Bees. May 11, 2016 Los Angeles Angels designated LF Ji-Man Choi for assignment. December 10, 2015 Los Angeles Angels claimed LF Ji-Man Choi off waivers from Baltimore Orioles. December 2, 2015 1B Ji-Man Choi assigned to Norfolk Tides. November 24, 2015 Baltimore Orioles signed free agent 1B Ji-Man Choi to a minor league contract. November 6, 2015 1B Ji-Man Choi elected free agency. October 16, 2015 1B Ji-Man Choi assigned to Estrellas de Oriente. August 20, 2015 Tacoma Rainiers activated 1B Ji-Man Choi from the 7-day disabled list. August 12, 2015 Tacoma Rainiers sent 1B Ji-Man Choi on a rehab assignment to AZL Mariners. April 7, 2015 Tacoma Rainiers placed 1B Ji-Man Choi on the 7-day disabled list. March 7, 2015 Seattle Mariners sent 1B Ji-Man Choi outright to Tacoma Rainiers. March 5, 2015 Seattle Mariners designated 1B Ji-Man Choi for assignment. October 8, 2014 OF Ji-Man Choi assigned to Tigres de Aragua. September 29, 2014 Seattle Mariners recalled 1B Ji-Man Choi from Tacoma Rainiers. June 14, 2014 1B Ji-Man Choi assigned to Tacoma Rainiers from Jackson Generals. June 9, 2014 1B Ji-Man Choi assigned to Jackson Generals from Tacoma Rainiers. June 9, 2014 Seattle Mariners reassigned 1B Ji-Man Choi to the minor leagues. April 17, 2014 Tacoma Rainiers placed 1B Ji-Man Choi on the restricted list. April 17, 2014 Seattle Mariners placed 1B Ji-Man Choi on the restricted list. March 11, 2014 Seattle Mariners optioned 1B Ji-Man Choi to Tacoma Rainiers. November 20, 2013 Seattle Mariners selected the contract of Ji-Man Choi from Tacoma Rainiers. August 19, 2013 Ji-Man Choi assigned to Tacoma Rainiers from Jackson Generals. June 3, 2013 Ji-Man Choi assigned to Jackson Generals from High Desert Mavericks. April 3, 2013 Ji-Man Choi assigned to High Desert Mavericks from Clinton LumberKings. August 20, 2012 Ji-Man Choi roster status changed by Clinton LumberKings. August 6, 2012 Clinton LumberKings placed C Ji-Man Choi on the 7-day disabled list. September 23, 2010 High Desert Mavericks activated C Ji-Man Choi from the 7-day disabled list. September 2, 2010 High Desert Mavericks placed C Ji-Man Choi on the 7-day disabled list. August 18, 2010 C Ji-Man Choi assigned to High Desert Mavericks from AZL Mariners. June 21, 2010 Ji-Man Choi assigned to AZL Mariners from Seattle Mariners. June 20, 2010 Seattle Mariners signed free agent C Ji-Man Choi to a minor league contract.